Who else enjoys the trails at Ringtail Ridge? The trees planted along Tex’s Trail and the Panhandle Trail at the 45-acre natural area off Old Ranch Road 12 were looking healthy but in need of maintenance. A quick swipe with the string-trimmer, hand weeding where the grasses and weeds were too close to the trunk and new mulch proved just the ticket. Especially since we rely on rainwater for most of the water. In a few years the oak and anacua saplings will provide much needed shade in these hot summer months. While returning on Tex’s Trail to the parking lot I spied a Greater Roadrunner out for the morning run and hunt. Using the trail and even hopping up on the bench for a better view the bird clearly had the run of the trails and enjoyed them as much as the hikers and runners who shared them. The Berms trail was navigable as it had recently been cut by the trail crew and the bed of cut grass provided a somewhat clean walking environment. The best part about the Berms is that it meanders past the three ponds used by the old slaughterhouse operation. After heavy rains water collects in one or all three ponds. Then the bugs come out. In addition to the many dragon flies and damsel flies many other food sources make an appearance. 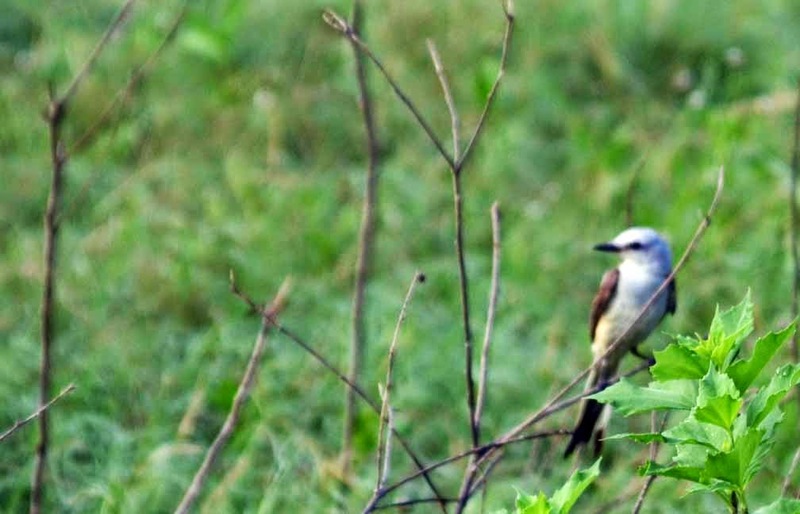 We saw the Scissor-tailed flycatcher but also Barn Swallows, Cave Swallows, Chimney Swift and Ash-throated flycathcher. The Ridge Loop was less muddy on Monday after working on the anacuas which are expected to replace many of the hackberry trees which are falling victim to the drought. 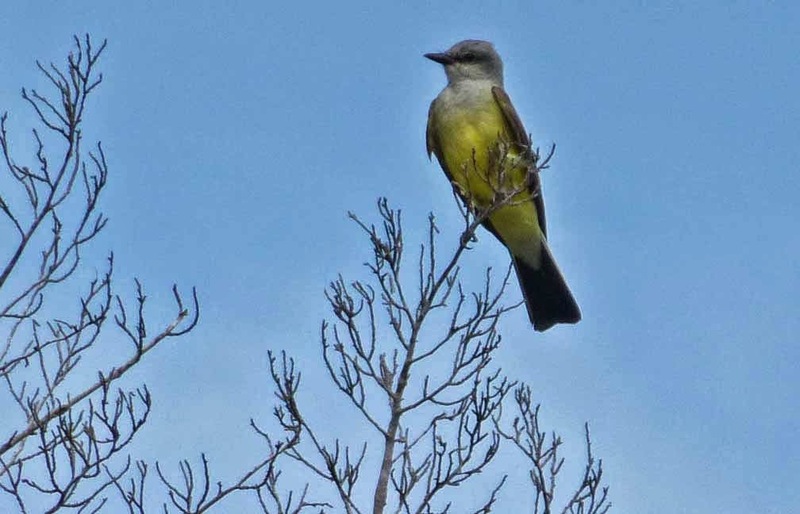 Very quickly upon arriving at the top of the ridge were at least a half-dozen Western Kingbirds with their bright yellow breasts sitting in the ashe juniper waiting their next meal to fly past. They could have been Couch’s Kingbird as I had every opportunity to look for the tell-tale white line visible in flight. And they did fly — racing skyward to grab a flying insect from the air and return on a new perch to snack. The birding hikes take place on the first Saturday of the month and are typically in one of the natural areas or along the San Marcos River. Contact Stephen Ramirez at [email protected] to be placed on the list.